According to Iain Mc Gilchrist we have two mutually exclusive modes of being; the left hemispheric mode and the right. He postulates that the left is predominantly concerned with the self; my needs and wants, and the right is predominantly concerned with everything else; other people and the world we all inhabit. The left tends to stand aloof from life, interested only in and constantly regurgitating what it already knows. Essentially it’s a virtual world, parading as reality. The right experiences life through the senses (sight, sound, touch and smell) moment by moment, but because it almost always passes on these experiences to the left for an evaluation instantaneously, we are generally unaware of it. The right hemisphere is a fragile state of presence, easily broken by stimuli from within and without. This elusive mode of being is in fact our only reality. Because of the way we have evolved, sequential language and its good friend the thinker, have come to dominate and so we are all primarily left hemispheric. Me too, I can go for hours without having any real awareness of my actual experience. I often go about my various tasks and activities, preoccupied with evaluations, fantasising about what could be and mulling over past experiences. Even when I’m listening to someone, I can become lost in my own thoughts! Both hemispheres have different ways of seeing. The right sees objects in all their abstract complexity; the shapes, colours, patterns and edges. It also sees the relationships and connections between all the elements. The left sees objects as separate entities with outlines and details. It scans visual data quickly in order to evaluate it and move on. It’s impossible to draw realistically when you are in your left hemisphere, because seeing what’s authentic is not in it’s job description. It’s job is to re present experience by referring to the past and predicting the future. If you were drawing an eye in your left hemisphere you would probably draw something like this; a simplified version of reality – a symbol. This is your symbol for an eye; what you think you know. 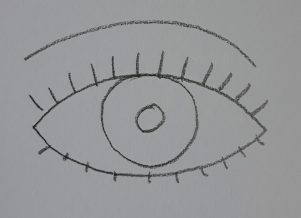 An eye has pointy ends, a circle in the middle with another smaller circle inside. In fact, a real eye only bears a vague resemblance to your symbol and you know this because of that well of unconscious right hemispheric visual knowledge you have, but you don’t know how you know. It can be very frustrating for the would-be drawer! Our right hemisphere can see the visual data as it really is. This is a closer version of an eye, seen by the right hemisphere, its form understood and accepted by the left. It’s a linear version, so is never going to look exactly like a real eye, but notice how unlike our symbol it is, how assymetrical. Spot the straight lines and the shifts in direction. But if we did a tonal or coloured version, we could come up with an almost exact replica, depending on our degree of drawing experience. 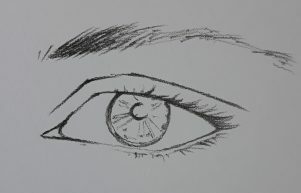 Everyone can learn to draw a realistic eye just by learning a few tips about the way it is constructed with the left hemisphere and seeing and recording the authentic visual information with the right. 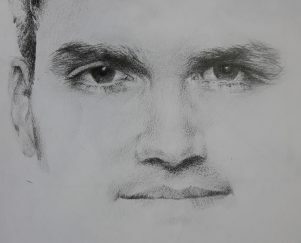 Anyone who wants to, can learn to draw in my three foundation online drawing courses, where I show you how to activate the visual powers of your right hemisphere and harness your left as a discerning supporter.